Armenia is dynamically integrating into European structures. The inclusion of the republic in the Eastern Partnership initiative can encourage closer cooperation with Europe and offer a stability and security guarantee. Head of the European Commission Delegation to Armenia, Ambassador Raul de Luzenberger commented to PanARMENIAN.Net on prospects for the initiative. The EC welcomed the idea of EP. What are the expectations for the initiative? With the Eastern Partnership the EU offers its Eastern partners concrete, far-reaching support for democratic and market-oriented reforms and thus contribute to their political and economic stability. All these neighbors are already striving to undertake political, social and economic reforms, and have stated their wish to come closer to the EU. EU enlargements have brought Eastern countries closer to the EU and their security, stability and prosperity increasingly impacts on the EU’s. Events in the countries in Eastern Europe and in the Southern Caucasus affect the EU, as last summer’s conflict in Georgia showed vividly. This winter’s gas crisis is another example of our mutual dependence. The Eastern Partnership will add a multilateral dimension to our cooperation. This is an issue of great importance for Armenia and we hope that this multilateral format of the Eastern Partnership will substantially contribute to the development of the regional cooperation in Southern Caucasus. What are the differences between the ENP and the EP? The Eastern Partnership is an initiative developed within the framework of the European Neighborhood Policy to implement and reinforce it. As for ENP, also for the EP how far we go in relations with each country will continue to depend on the progress made by the partners in their reform and modernization efforts. The Eastern Partnership has a strong emphasis on shared European values. The success of this initiative will depend on strong political will of EU Member States and partner countries alike – joint ownership is essential in this. The Commission will also play a crucial role in making the multilateral framework an effective tool for cooperation. After adoption by the European Council the Eastern Partnership will be launched at an “Eastern Partnership Summit” in May 2009 involving the Heads of the States or Governments of EU Member States and Partner Countries. From then onwards biennial summits will be held to provide direction and profile to the Partnership. Annual meetings of Foreign Affairs Ministers should review progress and provide more detailed political guidance. 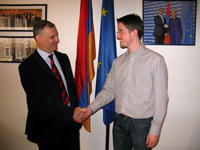 With the new programs implemented, how will the Armenia-EU relations develop in the future? The Commission’s proposal for a new Eastern Partnership represents a step change in the EU’s relations with Armenia, Azerbaijan, Belarus, Georgia, Moldova and Ukraine. This ambitious Partnership foresees a substantial upgrading of the level of political engagement, including the prospect of a new generation of Association Agreements, far-reaching integration into the EU economy, easier travel to the EU for citizens providing that security requirements are met, enhanced energy security arrangements benefiting all concerned, and increased financial assistance. The EU proposes much more intensive day to day support for partners’ reform efforts through a new Comprehensive Institution Building programme, and a new multilateral dimension which will bring partners together to address common challenges. The Eastern Partnership includes new measures to support the social and economic development of the 6 countries, and five flagship initiatives (i.e. Integrated Border Management Pr ogramme, Small and Medium sized Enterprise Facilities, Regional electricity markets, renewables and energy efficiency, Southern energy corridor and Prevention of, preparedness for, and response to natural and man-made disasters) that will give very concrete evidence of the EU support. How do you assess Armenia’s moves for integration into European structures? I would like to stress that a lot still needs to be done, particularly concerning good governance, the fight against corruption and the independence of the judiciary. The Commission will soon deploy high level experts through the EU Advisory Group to assist the Armenian administration in their reform efforts. These reforms are essential to help Armenia draw the advantages of a closer relationship with the EU. The implementation of the Eastern Partnership will provide opportunities to intensify significantly our joint work in particular as regards Armenian efforts towards strengthening democratic structures, economic reforms and regulatory approximation. Azerbaijan is also included in the EP. Can the NK conflict resolution influence the implementation of the initiative? The Eastern Partnership will add a multilateral dimension to EU bilateral cooperation with each partner country. Strengthening regional cooperation in the South Caucasus could prove a very effective means to support both Armenia and Azerbaijan in the achievement of a peaceful settlement of the conflict. Improvements in Armenian-Turkish relations are also welcomed by the EU. The EU supports the OSCE Minsk Group efforts to solve the Nagorno Karabakh conflict.